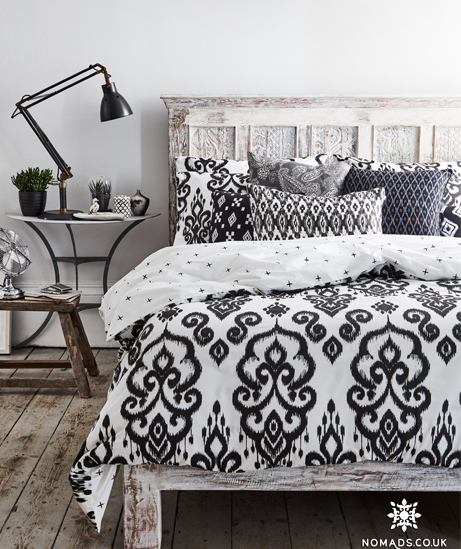 We thought it would be great to try a different look with this versatile bedding collection, so we called Diana Civil (one of the UK’s leading home stylists) and asked her to create a fresh perspective on our popular selling Ikat collection. Diana did some great thinking and hunting around and curated a stunning mixture of our current product lines with various special new and vintage pieces to create what you are seeing now in the 1st part of the Panthera collection. So a few weeks ago we drove south to London with our team to capture our Tribal inspired design Ikat bedding called the “Panthera Ikat Collection” with a City Urban look. We found a brilliant photo shoot location near London in an amazing big old Victorian house with seven ! bedrooms owned by some really helpful owners. We all arranged to get there early at 8am so we could squeeze every minute of the available daylight. Diana arrived with here amazing styling assistant, as well as Russ and his Digital Manager to operate the Mac’s. While at the same time the Logistics guys turned up with their lorry with all the different beds, furniture and accessories needed for the whole days shoot, to get some perspective we were creating and capturing Three different room sets in one day. So glad we didn’t have to hump all these amazing beds in up the stairs, which were built to last and looked really cool (this bed was courtesy of the guys at Barker and Stonehouse), and look stunning as you can see in the different pictures. So as all the furniture and boxes were coming in, we were also moving in all our carefully folded and ironed bedding, cushions and textiles, we had been given a staging room upstairs to unpack all the products for the shoot, and as we carefully opened all our boxes the room filled with Colour and a riot of patterns, chaotic pleasure. We also managed to get a nice shot showing our Black Bear Faux Fur bed throw draped over the bed, a brilliant combination.